British-israel.us -- Did Jacob Use Corrals With Aphrodisiacs to Selectively Breed Spotted Goats and Sheep? Genesis chapters 29-31 Star Chart: Clockwise from when Jacob "looked, and behold a well in the field, and, lo, there were three (lunar) flocks of sheep lying by it; for out of that well they watered the (lunar) flocks: and a great (solar) stone was upon the well's mouth" (29:2) and "Jacob (Aquarius) went near, and rolled the (lunar) stone from the (Capricorn) well's mouth, and (Crater and Aquarius) (white radius) watered the flock of Laban his mother's brother" in 1714 B.C. till Jacob loved Rachel; and said, I will serve thee seven years for Rachel thy younger daughter" ending in 1707 B.C. (29:18) is 84° months (7 x 12 = 84°) "when the Lord saw that Leah was hated", and "he opened her (lunar) womb: but Rachel was barren" (29:31) (half moon is half black and half white) till Jacob "served with him yet seven other years" for Leah (29:30) ending in 1700 B.C. is 168° months (84 + 84 = 168°) when "God remembered Rachel, and God hearkened to her, and opened her (lunar) womb" (29:22) in 1694 B.C. till "Jacob took him (green radius) rods of green poplar, and of the hazel and chesnut tree; and pilled white strakes in them, and made the white appear which was in the (white radius) rods" (30:37). "And it came to pass, whensoever the stronger cattle did conceive, that Jacob laid the rods before the (lunar) eyes of the cattle in the gutters, that they might conceive among the (white radius) rods. But when the cattle were feeble, he put them not in: so the feebler were Laban's, and the stronger Jacob's. And the man increased exceedingly, and had much cattle" (30:41-43) and saw in a dream "all the (lunar crescent-horned) rams which leap upon the cattle are ringstraked, speckled, and grisled" (lunar black and white) (31:12) (selective breeding) and "he carried away all his cattle, and all his goods which he had gotten, the cattle of his getting, which he had gotten in Padanaram, for to go to Isaac his father in the land of Canaan" (31:18) in 1694 B.C. is "twenty years" (31:41) (7 + 7 + 6 = 20). Each of these three segments also represents Leah's "week" (29:27) of seven days, Rachel's week of seven days and Laban's six days of pursuit till God "rebuked" him (31:23-25,42). Since the first seven years had been prior to his two marriages, all of his eleven sons and one daughter must have been born during a seven-year period ending in 1700 B.C. when he asked Laban to dismiss him. The dominant color traits in Laban's flocks and herds were evidently white among the sheep, black among the goats, and brown among the cattle. Most of the animals were of these colors, but there were a few that were spotted and speckled among the cattle and goats, and brown among the sheep. It was of these that Jacob's pay would be. Water treated with a chemical may have served as an aphrodisiac and fertility promoter among the cattle [and other animals]. At least one such chemical substance found in these trees has been used for such a purpose in both ancient and modern times. He used the rods in the troughs when the stronger animals drank, but not when the weaker ones came there. Thus the stronger animals were stimulated to mate, and the others were not. This measure constituted a sound practice of animal husbandry. Jacob agreed to keep feeding and tending the flocks if he could have all the spotted and speckled sheep and goats. The Biblical story describes how Jacob had a dream in which God instructed him to use only spotted rams for breeding, and this resulted in a flock that soon consisted almost entirely of spotted offspring. This Biblical reference is one of the oldest documented examples of selective breeding. To accomplish his purposes, Jacob built corrals at the watering spots and confined selected ewes with a spotted (lunar crescent-horned) ram. Whiteness in sheep is dominant, color is recessive. 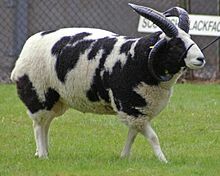 What that means, essentially, is that there are sheep that will appear white that nevertheless carry a gene for color. They are called heterozygous. What Jacob realized, being smart and living with sheep and breeding them for years, is that even "pure" white sheep that bred sometimes had colored offspring (as would be expected in heterozygous white sheep). Where this diverged from accepted breeding knowledge of the time was that the farmers thought that white was "pure" and that color would "spackle" the white, so to speak. Laban thought that by removing all the colored sheep from the flock, there would be no color to "depurify" the white sheep. This was a mistake. In fact, had Laban wanted to strip Jacob of all ability to profit, he would have made white sheep the payment, and removed all the white sheep from the flock. At that point, another white sheep would never have been born. As Jacob selectively breeded (through the use of aphrodisiacs and corrals) the white sheep with the colored, he increased the incidence of heterozygous genotype/white phenotype sheep, which, in turn increased the incidence of colored offspring, until the majority of the sheep were colored, and there were no homozygous dominant left in the herd. Think of this in terms of eye color, which may help explain it: Brown is dominant, blue recessive. You can have a blue-eyed child born to parents who both have Brown eyes; if both parents are hybrid/heterozygous brown (Bb), an estimated 25% of their offpsring will be bb, and have blue eyes. The same of the sheep. Pure White (W) is dominant. Taking out the ww sheep (the homozygous recessive spotted ones) still left Ww sheep in the flock. Heterozygous sheep tend to be stronger and more virile breeders. So, when Jacob mates the stronger sheep together, he’s mating heterozygous Ww. The expected result of such a pairing is that only one in four offspring will appear colored, but only one in four offspring will actually be “pure” white. The other three carry the recessive gene. Jacob and Laban reached an agreement that from that day forward, all of the goats and sheep (livestock) born into Jacobs' herd that were not solid white would be Jacob's. Now this would be very difficult after Laban removed all animals with any color from the herd Jacob was tending and sent them off three days journey away. I believe that Jacob knew, and we now know, that some of the animals carry a heterozygous (recessive) gene (color) even while appearing to be homozygous (dominate) solid white. Now the first couple of years must have been very slow and frustrating while a small number of colored animals were born. But after a couple of years when Jacob got some colored males in the herd he began to breed all of the best animals with males that were dominate colored. This sharply increased the number of colored animals in the herd. Add to this the use of some kind of aphrodisiac in the watering troughs, which induced the females into "heat" allowing the selective breeding of the best, strongest, healthiest animals. The rods probably contained some substance that increased the estrus in the herd. Today we have similar substances that come in a bottle, are injected into the animal and are very effective in starting the estrus. In cattle herds and swine herds, it is common to inject a certain number of animals that the operation intends to breed for a given period of time, in that way inducing the estrus at a time convenient for the operator. All of this is exactly what I understand Jacob to have been doing with the peeled rods in the drinking troughs. The end results were that after six years Jacob had a herd of colored animals, with very few if any of the white animals left. By the 4th or 5th year every animal born in the herd was showing some sign of color, because the selective breeding on Jacob's part meant that every animal carried the colored genetics. Even the white female animals were throwing colored offspring because of the colored males used as sires and the fact that the females carried a recessive trait for color. To put it another way, only the striped, speckled, and mottled males were mating, none of the rest. Now this we know to be a very significant factor in determining the characteristics of the offspring. “Like father, like son,” we say. God was working on a premise that is scientifically proven. How was it that only the striped, speckled, and mottled males were mating? Simple. God appointed it to be so in order that Laban’s wealth would be passed on to Jacob. Also a man who did not have sons of his own could adopt a near relative, who would then become his son. At times this “son” would be given a daughter in marriage by his new “father.” If the father later had sons of his own, the inheritance would have to be divided among these heirs in some fashion. The son who had the rights of the firstborn and, therefore, headship over the family, would in that culture, be given the household gods, which would signify his headship. “The interpretation would then run something like this. Laban adopted Jacob (at least he made him a member of his household and made him heir, sealing the transaction by giving Jacob a daughter to be his wife. As long as Laban lived, Jacob had the responsibility of caring for him. When Laban died Jacob would inherit Laban’s estate in full if Laban failed to have any sons. If Laban had natural sons, each would receive an equal share of the property, and one of them would receive the household gods, which signified headship of the family.” Howard F. Vos, Genesis and Archaeology (Chicago: Moody Press, 1963), p. 99. Cf. also Harold G. Stigers, A Commentary on Genesis (Grand Rapids: Zondervan, 1976), p. 231. From these facts we can read somewhat between the lines of the story and surmise with some degree of confidence the cause of the change in attitude toward Jacob and his family. Initially Laban would have looked on Jacob as his son, his heir; but when sons of his own came, this was no longer needed. In fact, Jacob was now a competitor for the family inheritance. When Jacob prospered at Laban’s expense, it is easy to understand why Laban’s sons looked on him with disfavor, for all their inheritance was fleeing before their very eyes. Thus, the change in attitude on the part of Laban and his sons brought about a change of plans for Jacob. to Selectively Breed Spotted Goats and Sheep? 2 And he (Orion) (white radius) looked, and behold a (solar) well in the field, and, lo, there were three (lunar) flocks of sheep lying by it; for out of that well they watered the flocks: and a great (solar) stone was upon the well's mouth. 3 And thither were all the flocks gathered: and they rolled the stone from the well's mouth, and (white radius) watered the (lunar) sheep, and put the (solar) stone again upon the well's mouth in his place. 4 And Jacob (Orion) (white radius) said unto them, My brethren, whence be ye? And they (Aquarius, Auriga and Hercules) said, Of Haran are we. 5 And he said unto them, Know ye Laban the son of Nahor? And they (white radius) said, We know him. 6 And he said unto them, Is he well? And they said, He is well: and, behold, Rachel (Auriga) his daughter cometh with the sheep. 7 And he said, Lo, it is yet high day, neither is it time that the (Taurus) cattle should be gathered together: (Crater and Aquarius) (white radius) water ye the (Aries) sheep, and go (Ophiuchus and Orion) and (solar golden grain) feed them. 8 And they (white radius) said, We cannot, until all the (lunar) flocks be gathered together, and till they roll the (solar) stone from the well's mouth; then we water the (lunar) sheep. 9 And while he yet spake with them, Rachel (Auriga) came with her father's (lunar) sheep; for she kept them. 10 And it came to pass, when Jacob (Orion) (white radius) saw Rachel (Auriga) the daughter of Laban his mother's brother, and the (lunar) sheep of Laban his mother's brother, that Jacob (Aquarius) went near, and rolled the (lunar) stone from the (Capricorn) well's mouth, and (white radius) watered the flock of Laban his mother's brother. 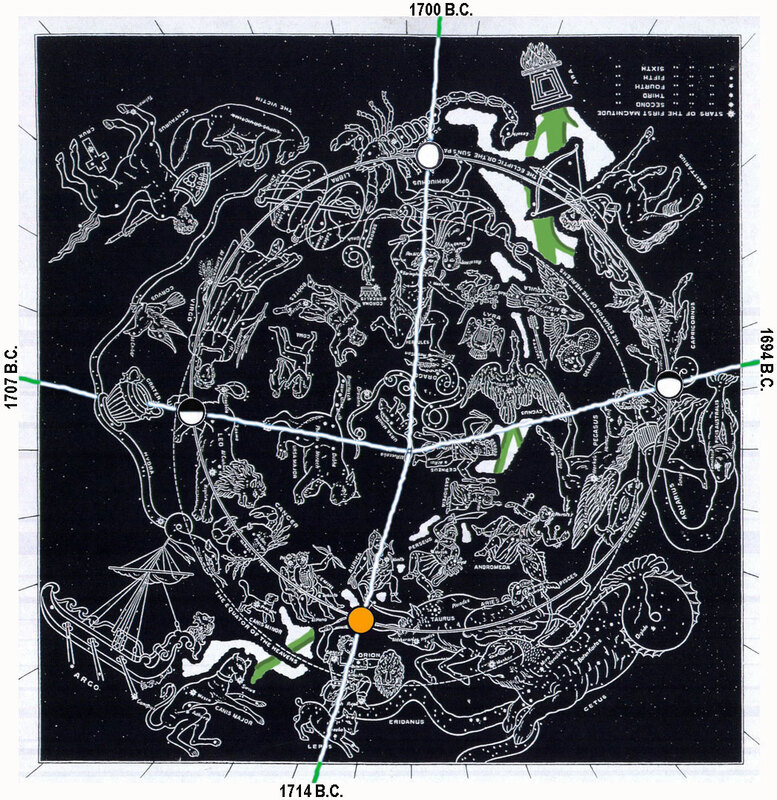 11 And Jacob (Orion) (white radius) kissed Rachel (Auriga), and lifted up his (white radius) voice, and wept. 12 And Jacob (Orion) (white radius) told Rachel (Auriga) that he was her father's brother, and that he was Rebekah's son: and she (white radius) ran and told her father. 13 And it came to pass, when Laban (Hercules) heard the tidings of Jacob his sister's son, that he (Hercules) ran to meet him, and embraced him, and kissed him (Ophiuchus), and brought him to his house. And he told Laban all these things. 14 And Laban (Orion) said to him, Surely thou art my bone and my flesh. And he abode with him the space of a month. 15 And Laban (Orion) (white radius) said unto Jacob, Because thou art my brother, shouldest thou therefore serve me for nought? tell me, what shall thy wages be? 17 Leah was tender eyed; but Rachel (Auriga) was beautiful and well favoured. 18 And Jacob (Orion) loved Rachel (Auriga); and (white radius) said, I will serve thee seven years for Rachel (Auriga) thy younger daughter (84 degree months). 19 And Laban (Orion) said, It is better that I give her to thee, than that I should give her to another man: abide with me. 21 And Jacob (Orion) (white radius) said unto Laban (Hercules), Give me my wife (Auriga), for my days are fulfilled, that I may go in unto her. 22 And Laban (Orion) gathered together all the (Gemini, Hercules Ophiuchus, Aquarius, etc) men of the place, and made a feast. 23 And it came to pass in the evening (sun on white radius horizon), that he took Leah (Auriga) his daughter, and brought her to him; and he (white radius) went in unto her. and he went in unto her; or lay with her as his wife; a modest expression of the use of the bed. (o) Tournefort's Voyage to the Levant, vol. 3. p. 255. (p) Ockley's Account of Southwest Barbary, c. 6. p. 78. 25 And it came to pass, that in the (sun on the white radius horizon) morning, behold, it was Leah (Auriga): and he said to Laban (Hercules), What is this thou hast done unto me? did not I serve with thee for Rachel (Auriga)? wherefore then hast thou beguiled me? he beguiled his own father, pretending he was his brother Esau; and now his father-in-law beguiles him, giving him blear eyed Leah instead of beautiful Rachel. 26 And Laban (Orion) said, It must not be so done in our country, to give the younger before the firstborn. Jacob, who deceived his father and his brother, is made to suffer himself from deception. 27 Fulfil her week (84 degrees), and we will give thee this also for the service which thou shalt serve with me yet seven other years (84 degrees). 28 And Jacob did so, and fulfilled her week (7 days): and he gave him Rachel (Auriga) his daughter to wife also. 30 And he (white radius) went in also unto Rachel (Auriga), and he loved also Rachel more than Leah (Auriga), and served with him yet seven other years (84 degrees). 31 And when the Lord saw that Leah was hated, he opened her (lunar white) womb: but Rachel (lunar black) was barren ( half moon is half black and half white). (x) Pirke Eliezer, c. 36. 30:1 And when Rachel (white radius) saw that she bare Jacob no children, Rachel envied her sister; and said unto Jacob, Give me children, or else I die. 2 And Jacob's (Orion's) anger was kindled against Rachel: and he said, Am I in God's stead, who hath withheld from thee the fruit of the womb? 3 And she said, Behold my maid Bilhah (Auriga), go in unto her; and she shall bear upon my knees, that I may also have children by her. 4 And she gave him Bilhah her handmaid to wife: and Jacob (white radius) went in unto her. 7 And Bilhah Rachel's maid (white radius) conceived again, and bare Jacob a second son. 8 And Rachel (Auriga) (white radius) said, With great wrestlings have I wrestled with my sister, and I have prevailed: and she called his name Naphtali. 9 When Leah saw that she had left bearing, she took Zilpah (Auriga) her maid, and gave her Jacob (Orion) to wife. 11 And Leah (white radius) said, A troop cometh: and she called his name Gad. 16 And Jacob (Orion) came out of the field in the evening, and Leah (Auriga) went out to meet him, and said, Thou must come in unto me; for surely I have hired thee with my son's mandrakes. And he lay with her that night. 19 And Leah (white radius) conceived again, and bare Jacob the sixth son. 22 And God remembered Rachel, and God hearkened to her, and opened her (white lunar gibbous) womb. 32 I will pass through all thy flock to day, removing from thence all the (lunar white and black) speckled and spotted cattle, and all the brown cattle among the sheep, and the spotted and speckled among the goats: and of such shall be my hire. Jacob will begin the new term of service with nothing in his favour. All the sheep that he will tend will be white, and all the goats black. 37 And Jacob took him (green radius) rods of green poplar, and of the hazel and chesnut tree; and pilled white strakes in them, and made the white appear which was in the (white radius) rods. Jacob’s trick turns upon the whiteness of the rods; and this supplies a play upon the name “Laban” (= “white”), who is outwitted by Jacob. The device is said to be well known to shepherds. “Strake” is Old English for “streak”; cf. Leviticus 14:37. 38 And he set the rods which he had pilled before the (lunar) flocks in the gutters in the (Milky Way) watering troughs when the flocks came to drink, that they should (white radius) conceive when they came to drink. 41 And it came to pass, whensoever the stronger cattle did conceive, that Jacob laid the rods before the (lunar) eyes of the cattle in the gutters, that they might conceive among the (white radius) rods. 42 But when the (lunar) cattle were feeble, he put them not in: so the feebler were Laban's, and the stronger Jacob's. 31:1 And he heard the (white radius) words of Laban's sons, saying, Jacob hath taken away all that was our father's; and of that which was our father's hath he gotten all this glory. 2 And Jacob beheld the countenance of Laban, and, behold, it was not toward him as before (black lunar frown rather than solar radiating sun). 5 And said unto them, I see your father's countenance, that it is not toward me as before (black lunar frown rather than sunny); but the God of my father hath been with me. 8 If he said thus, The speckled shall be thy wages; then all the cattle bare (lunar) speckled: and if he said thus, The ringstraked shall be thy hire; then bare all the (lunar) cattle ringstraked. 9 Thus God hath taken away the (lunar) cattle of your father, and given them to me. 12 And he said, Lift up now thine (lunar) eyes, and see, all the rams which leap upon the cattle are (lunar) ringstraked, speckled, and grisled: for I have seen all that Laban doeth unto thee. 14 And Rachel and Leah (Auriga) answered and said unto him, Is there yet any portion or inheritance for us in our father's house? the price paid for us. Laban had taken to himself the full profits of Jacob’s fourteen years’ service as the gift, or mohar, to the bride’s family; but had assigned nothing of it as the dowry or gift to the two brides. Cf. Genesis 24:53. This conduct they imply was contrary to usual custom, and was part of his stinginess. It was too late now to expect him to give anything back. 19 And Laban went to shear his (lunar)sheep: and Rachel had stolen the images that were her father's. 22 And it was told Laban (Hercules) on the third day that Jacob (Orion) was fled. Gilead; said to be three hundred and eighty miles from Haran (e)(e) Bunting's Travels, p. 72. 25 Then Laban overtook Jacob. Now Jacob had pitched his (white radius)tent in the mount: and Laban with his brethren pitched in the mount of Gilead. 31 And Jacob (Orion) (white radius) answered and said to Laban (Hercules), Because I was afraid: for I said, Peradventure thou wouldest take by force thy daughters from me. 33 And Laban went into Jacob's (white radius) tent, and into Leah's (white radius) tent, and into the two maidservants' (white radius) tents; but he found them not. Then went he out of Leah's tent, and entered into Rachel's tent. 40 Thus I was; in the day the drought consumed me, and the frost by night; and my sleep departed from mine (lunar) eyes. Did Jacob reap what he sowed? Jacob had stolen Isaac's blessing from Esau and had charged a very high price to Esau for a bowl of soup. Apparently Laban charged a very high price for Jacob's wives and attempted to steal Jacob's wages also. But Laban's scemes failed because Jacob had done God's will in obtaining the blessing, even though by a wrong method and deceitfully. Jacob had also done God's will in obtaining the birthright. But notice in the next chapter that Jacob gives his brother a generous gift out of his flocks. 45 And Jacob (Orion) took a (solar) stone, and set it up for a pillar. 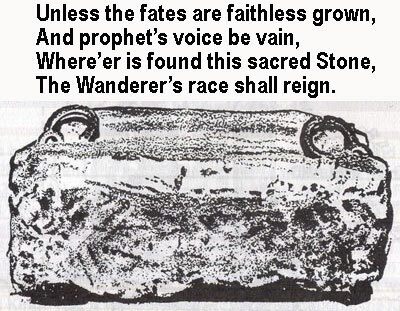 46 And Jacob (white radius) said unto his brethren, Gather (lunar) stones; and they took stones, and made an heap: and they did eat there upon the heap. 47 And Laban (white radius) called it Jegarsahadutha: but Jacob (white radius) called it Galeed. 54 Then Jacob offered (solar) sacrifice upon the mount, and called his brethren to eat (solar) bread: and they did eat (solar) bread, and tarried all night in the mount. 55 And early in the morning Laban (Orion) rose up, and kissed his (Auriga) sons and his (Auriga) daughters, and blessed them: and Laban departed, and returned unto his place.